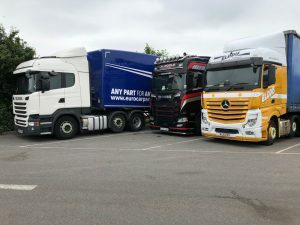 Motorway services are sometimes a necessary evil for many truck drivers, but isn’t it good when there’s a much better alternative about half a mile away from them? 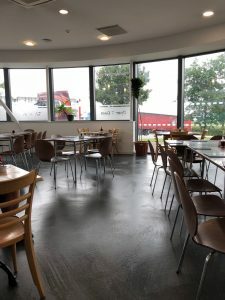 That’s the case at Junction 24 on the M5 where the Junction24 Truckstop offers much better quality of food, more of it and at a much cheaper price than the nearby services that will lure the commoner garden joe public. Good quality food, using locally sourced ingredients is a big selling point of the establishment, and we can vouch that the quality is good. 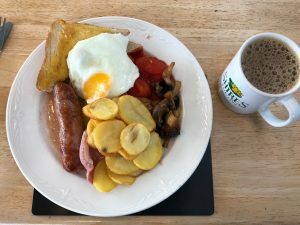 The Farmer’s Breakfast comprises eight items, including a butcher’s sausage, two slices of back bacon, a free-range egg, mushrooms, fried potatoes, baked beans or tin tomatoes and fried bread or toast and costs £6.60. The smaller Market Breakfastis five items; sausage, bacon, egg, beans or tomatoes and fried bread or toast and this will set you back £4.65. The Vegetarian Breakfast has a Quorn sausage, egg, fried potatoes, mushrooms, beans or tomatoes and toast and is priced at £5.45. You can add extras as you so desire, namely Black pudding, fried bread, bacon, mushrooms, beans, tomatoes, or egg at 90p, sausage at £1.20, or fried potatoes at £1. There is also a Mini breakfast which comprises two mini sausages, toast, beans and scrambled egg and costs £3.75. Breakfasts are served until 1400 and drivers shouldnote items cannot be swapped on set breakfasts, and extra items will be charged for individually. There is also a wide range of Breakfast baps or sandwiches with a mix of fillings. For two free range fried eggs it’s £2.50, for bacon it’s £2.95 and sausages is £3.25. Bacon and egg is £3.60, while sausage and egg is£3.90 and finally bacon and sausage is£4.85. Lunch meals are served until 1645. There is a wide range of sandwiches and freshly baked baguettes, the former made using thick cut white or brown bread. All are served with salad garnish and crisps or a side of chips. They include butcher’s ham or mature cheddar cheese both at £3.70, tuna with or without mayonnaise for £3.80 while Somerset brie and cranberry orprawns with or without mayonnaise are both £4.95. A fish finger sandwich is £3.70. Freshly-made paninis are alsoserved with salad garnish and crisps or a side of chips and they include – fpor £4.95 – ham & cheese, Somerset brie & cranberry, Pepperoni, cheese & tomato or tuna & cheese while cheese & pickle is £4.75. Oven-baked jacket potatoes, which come with a side salad and coleslaw, are offered with a choice of fillings, namely butter for £3.50, mature cheese or baked beans for £4.75 or both cheese & beans at £5.60. Tuna, with or without mayonnaise, in a jacket spud is £4.95 and the same with cheese added is £5.65. Prawns, with or without mayonnaise, is £6.25. Junction 24 also offers a Somerset Summer Ploughman’s, served with salad, coleslaw, sweet pickle, pickled onion, sliced beetroot and a bread roll & butter and you can choose two of the following; mature cheddar cheese, Somerset brie or ham and costs £7.45 while the Somerset Winter Ploughman’s is a bowl of homemade soup, a chunk of cheese, bread roll, pickle & pickled onion and this is priced at £6.95. There are also fresh salads,made with lettuce, tomatoes, cucumbers, carrot, red onion, cress and coleslaw and they can be with cheese, ham or tuna at £6.45 or with prawns at £7.55. Toast and butter costs £1.10 and with jam or marmalade, it’s £1.90. egg on toast, be they fried, poached or scrambled, is £3, as is beans on toast. A side order of chips is £2.50 while cheesy chips are £3.35. Sausage, chips & beans is £5.95, eggs and chips is £4.35,ham, egg & chips is £5.50 or with extra ham and a second egg, it’s £6.65. There is a small appetite menu as well. This includes the likes of a small ham and cheese panini with chips or crisps and salad for £3.25, four chicken nuggets, chips & peas/beans or fish fingers, chips & peas/beans both for £3.50, the same price that is charged for a plainjacket potato with cheese or beans. The roast dinner of the day with roast potato and vegetables is £4.25 while two mini sausages, Yorkshire pudding, mash, peas & gravy or macaroni cheese with peas or carrot sticks are both priced at £4. A sandwich on white or malted brown bread, is £4 – choose from cheese, ham or tuna and they come with crisps and fruit. They are served with a glass of orange or blackcurrant squash or for 50p more you can have it with tea or a draught soft drink. Twoscoops of ice cream and sauce adds another £1.50. 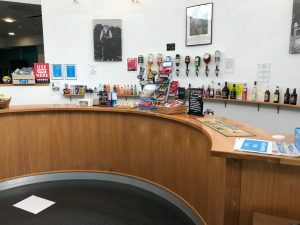 Junction 24 can cater for special dietary requirements, including vegans, gluten free and dairy free, however you need to give a day’s notice to ensure the products are available. There is always have gluten free gravy and Yorkshire puddings available. Junction 24 is open seven days a week; Monday-Thursday is 0700-2015, Friday is 0700-1500, Saturdays are 0700-1530 and Sundays are 0900-1400. The site can accommodate over 40 trucks of a night and its facilities include a restaurant, well-lit parking area, shower block, CCTV and onsite security and free Wi-fi. It cost £18 to park, which gives you full use of the facilities and a £5 meal voucher. SNAP, Key Fuels, DKV, UTA, HGV buddy and Morgan Fuelsare all accepted.